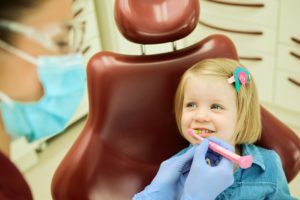 3 Tips for Your Child's First Dental Appointment | Smile Logic, Inc.
Having nightmares thinking about your child’s first dental appointment? The first time your child goes to the dentist doesn’t have to be scary for anyone involved. By taking some careful steps beforehand, you can ensure an overall positive experience for your child’s first time in a dentist’s chair. We’ve put together the three top tips for preparing your child for their first time saying “Ahhh…” Take a look and then book that first appointment with confidence! As a busy parent, you’re probably used to the idea of being a good role model for your child, even when it’s hard! When preparing your child for the first visit to the dentist, this is going to be the most important tip to follow. We often unknowingly project the fears or anxieties we have about something onto our child or the situation. Avoid scaring your child by not scaring yourself out, first and foremost. Practice deep breathing and envision success. Next, channel positivity and excitement. Walk into the dental office confidently, greet the receptionist with enthusiasm, and act as if you’re about to get in line for an amusement park ride. Your child will look up to you in this process and take the hint to be excited rather than scared. Before you even walk into that office, start introducing your child to the idea of going to the dentist early on. Choose a fun picture book that’s all about going to the dentist and read this with your child the week before his/her first dentist appointment. You can also show your child appropriate videos or listen to songs about going to the dentist. This will show your child that everyone goes to the dentist and that it can be a fun experience. If you use words like “scary” or “afraid” when referring to your child’s first dentist appointment, he/she will notice. Your child will automatically start thinking of going to the dentist as an intimidating or frightening thing. Be careful when choosing your words. Use positive adjectives and emphasize the importance of going to the dentist. Use it as a teaching opportunity to tell your child about the value of dental hygiene. When your child is brushing his/her teeth next, point out that the dentist would be proud of them for doing so. Your child will arrive at that first dental appointment feeling confident. It is definitely possible for your child to have a positive experience when he/she goes to the dentist for the first time. By using the right language ahead of time, introducing your child to the notion of the dentist in creative ways, and being a positive role model, your child will love going to the dentist! At Smile Logic, we’re all about making all of our patients feel comfortable in the dental chair, no matter how young or old. We really do take a revolutionary approach to dental care. Contact us today so we can get your child’s first dental appointment booked in the near future!